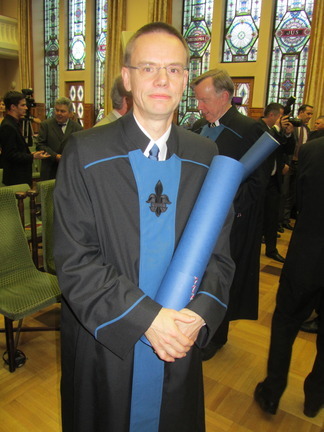 The University of Pécs conferred the degree of "Doctor et Professor Honoris Causa" on me at a ceremony held in Pécs, Hungary, on 7 November 2013. Recent: Jointly with Michael Braun, Tuvi Etzion, Alexander Vardy, and Alfred Wassermann, we found the first nontrivial q-analog of a Steiner system; this was also reported elsewhere. Jointly with Leonard Soicher, we showed that there is no McLaughlin geometry. Old: In 2004, Petteri Kaski and I showed that there are 11,084,874,829 Steiner triple systems of order 19; all of those billions of objects can be obtained here. In 2009, Olli Pottonen and I showed that there are 5983 perfect binary one-error-correcting codes of length 15. Together with Sampo Niskanen, we have developed Cliquer, routines for clique searching. The first public release (1.0) was made in late 2002; the current release (1.21) can be found here. I am a recipient of the 1996 Kirkman Medal, awarded by the Institute of Combinatorics and its Applications. I am co-Editor-in-Chief of the Journal of Combinatorial Designs and on the editorial boards of Ars Combinatoria and the Bulletin of the Institute of Combinatorics and its Applications. My research is financed in part by the Academy of Finland. Here are (in pdf) some recent papers that have been accepted for publication. I also maintain a list of all my publications. New lower bounds for q-ary error-correcting codes, A. Laaksonen and P. R. J. Östergård, Cryptography and Communications, to appear. New lower bounds on binary constant weight error-correcting codes, M. Braun, J. Humpich, A. Laaksonen, and P. R. J. Östergård, Journal of Combinatorial Mathematics and Combinatorial Computing, to appear. Orderly generation of Butson Hadamard matrices, P. H. J. Lampio, P. R. J. Östergård and F. Szöllősi, Mathematics of Computation, to appear. A marathon race takes only a little bit more than 2 hours for the elite. That is far from being a real endurance sport. You have to increase the running distance beyond 100k to find out who really has endurance. I have myself taken part in marathons in different sports. I maintain a list of all marathons that I have completed. For other sports than running, I have listed events that are at least 50k. Latest update: April 4, 2019.